Most of us won't say no to a good cup of coffee or glass of red wine, but over time, those indulgences (some might even say necessities!) stain your teeth, not to mention wear down your tooth enamel. Cigarette or chewing tobacco usage can color your teeth, and even some medications or medical conditions can cause staining. A stained, yellowing smile can appear older and unattractive, whereas a bright, whitened smile is youthful, friendly, and healthy-looking. Which smile do you want the world to see? 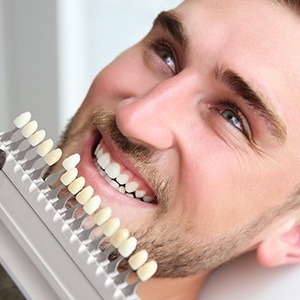 Why Choose Advanced Dental Care for Teeth Whitening? Epic Laser Teeth Whitening is performed in-office and uses a LaserWhite20 whitening gel in conjunction with a gentle BioLase laser that disperses light over a wider range of teeth at once, eliminating the need for multiple sessions. There are no messy strips or trays to use. 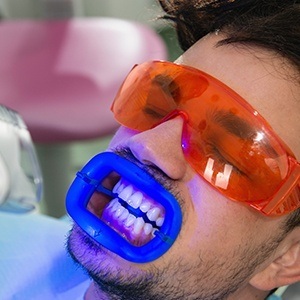 Epic Laser Teeth Whitening offers a lower risk of tooth sensitivity post-treatment. This techniques brightens teeth by four to six shades in as little as 20 minutes. Kör Teeth Whitening features a whitening gel infused with oxygen molecules, enabling your teeth to soak up much more of the gel and remove deeper stains. It is a permanent system that offers a much lower risk of tooth sensitivity than other at-home bleaching products. Thin, flexible dental trays are custom molded at Advanced Dental Care then worn at home for 2 weeks while you sleep. Results can whiten your teeth by up to 16 shades. Our office uses Zoom! Teeth Whitening with the latest Philips White Speed lamp and whitening gel for maximum results with minimum sensitivity. During your consultation, Dr. Jorgenson will perform an exam to ensure the patient is an eligible candidate for the procedure. He will determine your current tooth color using a shade matching guide to confirm what results you can expect. Zoom! 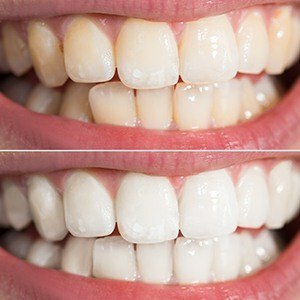 Teeth Whitening works best on yellowish-brown stains. If the patient has grayish stains or staining from antibiotics, Dr. Jorgenson will create a custom treatment plan for the best whitening results. We highly recommend that any whitening be performed only when the patient has recently had their teeth cleaned (within 3 months). The lamp can be adjusted for 3 levels of light intensity: low, medium, and high. We recommend that patients start with one to two 15-minute sessions and can go up to four sessions, depending on tolerance. Our staff will provide post-treatment instructions for maintaining your beautiful white smile! With Zoom! Teeth Whitening, we can make your smile up to 8 shades whiter in as little as 45 minutes! Zoom! works by combining a potent hydrogen peroxide gel with a specialized UV light to help it break up and eliminate even the most stubborn stains. The Zoom! system has multiple settings that can be used to prevent any post-treatment sensitivity. The results of these teeth whitening products are easily maintained with proper dental hygiene, dental exams, and by avoiding teeth-staining foods such as coffee, cola, and red wine. We know you’ll be impressed by the results and be more confident with your appearance. Give us a call today to schedule your appointment to reveal your rejuvenated whiter, brighter smile!